The principal contribution of the Malkha initiative is in its idea of rooting cotton handloom production in the rural economy, much against the trend in urban discourses. Neeta Deshpande reports. Andhra Pradesh is home to a diversity of exquisite handloom weaves renowned for their craftsmanship and aesthetic appeal. However, this beauty is hardly reflected in the lives of weavers, where motifs of distress and deprivation are dominant. Though they toil from dawn to dusk enmeshing warp with weft, the lives of these skilled artisans are in perpetual crisis. To address this grim scenario, the Malkha initiative is making a modest attempt to relocate the chain of cotton handloom production back within the rural economy. By placing all components of textile production in the hands of weavers and artisans, the intervention seeks to make them autonomous owners of their means of livelihood. Malkha, a neologism that conjoins the words Malmal and Khadi, is the brand name of natural-dyed handloom cloth produced by the Decentralised Cotton Yarn Trust in Andhra Pradesh. The distinctive feature of Malkha fabric is that, unlike other handloom interventions which use yarn manufactured by large-scale spinning mills, Malkha's yarn is manufactured in the villages themselves using special machines designed for small-scale handloom production. Thus, the Malkha process seeks to obviate the capital and resource intensive components in the conventional chain of the industrial manufacture of cotton cloth, thereby shrinking the overall ecological footprint. Fundamentally, it attempts to rescue cotton yarn and textile production from the monoculture of industrial textile manufacture, and reestablish it within the rural economy, to empower weavers and artisans through stable livelihoods. Uzramma, the driving force behind Malkha, is passionate about the cause of handloom as an ecologically sensible proposition intimately linked to the lives and livelihoods of weaver communities. Mention handloom, weavers or natural dyes, and Uzramma will overwhelm you with an abundance of stories, about the people, places and ideas that have kept her company in a two-decade long endeavour in pursuit of economic autonomy for producers within the textile craft tradition. To Uzramma, handloom is far from a pretty product targeting rich urban consumers. Though she believes that the traditional crafts of handloom and natural dyeing cannot survive today without the market that is available to them - the urban rich - she emphasizes that this is only a step towards the ultimate goal of making handloom a viable economic activity that can take its place in the wider economy across classes. Explaining the rationale behind the Malkha initiative, Uzramma told me during a conversation in Hyderabad that it is yarn which holds the key to solving the contemporary crisis in the handloom sector. To understand what Uzramma means, one has to step back in time to the pre-colonial era, when the famed cotton textiles of India were woven on looms operated by hand, using yarn that was also spun by hand. In his book The Transition to a Colonial Economy, economic historian Prasannan Parthasarathi explains the traditional symbiotic relationship between farmers and weavers which facilitated the production of cotton cloth. "Weaving in pre-colonial India, and the trade and production of cotton cloth", writes Parthasarathi, "cannot be studied in isolation from agriculture ... The cotton itself was a product of agriculture and much of the textile manufacturing work - from the cleaning and preparation of the cotton to the spinning of the yarn - was done by agriculturalists." Further, "It was not uncommon - especially in cotton-growing areas - for peasants to obtain their cloth by giving the yarn that had been spun in the household to these weavers, who were then paid for their services." With the advent of British rule in India, imported machine-made yarn was inflicted on the rural economy, which dramatically altered the delicate balance between producer communities. The first casualty of this shift was household hand-spinning. Weavers became dependent on machine-made yarn for their raw material, and farmers began to grow cotton suited to machine processing. "If there was anything that most succinctly defined British rule", writes Khadi scholar Rahul Ramagundam, "it was its role in the destruction of hand-spinning." As a result, the relationship of interdependence between farmers and weavers was cruelly sundered, so that these producers no longer owned their means of livelihood. The saga of the destruction of India's weaving industry and the subjugation of the country to supply raw material for British textile manufacture and serve as a market for foreign textiles is well known. Indeed, it was a cornerstone in the Indian indictment of the British Raj. Uzramma throws light on the consequences of the introduction of ginning (separating cotton from seed) on an industrial scale in India by the British in the 19th century. As small producers could not afford to set up ginning machines, capital-rich investors and money lenders entered the textile chain. In return for ginned cotton, the machine operators extracted the seed as payment from the farmer. This seed was then 'loaned' back to the farmer, who was forced to pay for it by way of harvested cotton. As a result, the farmer was alienated from his seed, and trapped in debt. Earlier, farmers had ginned cotton themselves using hand-gins, and saved the best seeds for propagation. With the introduction of mechanised ginning, all varieties and qualities of seeds were mixed together, and strains carefully husbanded over generations were lost. Further, centralised ginning enabled industrial scale spinning, which disrupted the continuity and collaboration in cotton textile production. At its core, the Malkha effort is an attempt to remake these broken linkages of interdependence, by relocating the component of spinning yarn - the missing link between farmers and weavers - back in the village. For yarn, weavers today are at the mercy of industrial spinning mills and the export market which causes extreme, unpredictable hikes in yarn prices, imperiling weavers and threatening their survival. Farmers in turn are enslaved by the complex and exploitative mechanisms of global cotton trade, as well as the machinations of a government which does not pay them a just price for their cotton crop. If cotton yarn is spun in the village itself, it will be the first step to farmers and weavers gaining autonomy over their livelihoods. This profound idea which dates back to Gandhi inspires the Malkha initiative as well. However, unlike Khadi which is woven on handlooms using hand-spun yarn, Malkha cloth is woven on handlooms using yarn manufactured by special machines designed for small-scale production. During a visit to a Malkha unit in Burgula, a village near Hyderabad, I was exposed to the nuts and bolts of this complex and innovative effort. Burgula is populated by around 1100 households, most of whom are engaged in farming, and scrape out a living below the poverty line. In 2008, a local trust actively involved in development work, joined hands with the Decentralised Cotton Yarn Trust, to set up a composite spinning and weaving unit in the village. Special machines designed by the Fractal Foundation in Chennai were installed, to enable pre-spinning processes at a scale hundred times smaller than conventional spinning mills. People in the village were trained to operate this scaled-down textile factory to produce yarn from cotton, and to weave it using handlooms. First generation weavers who had never operated a handloom learned to pass weft through warp to make ends meet. Gradually, the unit found its feet in the village, and now provides livelihood to about forty people employed in the various stages of making cloth from cotton. Currently, Malkha cloth is being produced in eight such units across different states, four of which are located in Andhra Pradesh. When I arrived at the Malkha unit in Burgula, I encountered a room full of odd-shaped machines whose operation had been interrupted by a power cut. I was informed that due to frequent power cuts which persisted through the day, the workers were staying up at night to operate the machines to produce yarn. "When will the power come back?" I asked, hopefully. "You never know. It could take half-an-hour, or several hours", replied the unit manager. These unpredictable and long power cuts were a routine affair. The workers tried to explain the operation of the machines, but I couldn't follow much of what they told me. "You have to see the machines in action to really understand", the manager finally said in mild exasperation. As I spoke to the workers, I wondered if I would have to go back to Hyderabad disappointed. All of a sudden, there was a rush of activity in the room. It was as if the unit had come to life, as the workers abruptly interrupted their conversation with me to get the machines up and running. The power supply was back - who knew when it would be disrupted again? Soon the workers were feeding loose cotton lint into a carding machine, which sucked it in and opened it up. Following this, the cotton sliver was processed by three other machines which made the cotton fibres parallel to each other, thinned and twisted them, and finally, almost magically, drew out fragile strands of cotton yarn! Within a matter of minutes, soft, unruly cotton was transformed into thin, uniform yarn in a small room, through a process that to the lay person looked completely mysterious. I would have never thought that watching cotton turn into yarn would be such a world of discovery in itself. In order to grasp the significance of the Malkha effort, one has to understand the lengthy, complex and resource-intensive processes in the conventional manufacture of cotton cloth. In order to export Indian cotton to England, the British introduced a mechanism to compress and tightly pack ginned cotton lint into bales as hard as wood. Baling of cotton continued in independent India, to economise on the transport of cotton from growing areas over long distances to centralised, gigantic spinning mills. In the spinning mill, the bales of cotton are separated into fibres and cleaned of solid residue by a series of heavy, costly and energy guzzling machines that make up the blowroom line. Capital and energy intensive modern spinning mills generate so much heat that an enormous quantity of water has to be used every day for cooling and humidification. Besides, compressing the cotton into tight bales using steam and high pressure, transporting it over long distances, and blowing it to unbale it soils and damages the fibres. The Malkha process seeks to avoid the long-distance transport of cotton, and as a result, do away with baling and unbaling. The machines used to spin yarn for Malkha fabric are compatible with the processes of handloom weaving and natural dyeing, because the preparatory process involved is less complex and more affordable. The operation is not only scaled down, its complexity is also reduced. The ecological price tag of cotton processing is thus minimised, and the operation becomes significantly cheaper and more affordable for decentralised implementation in rural areas. 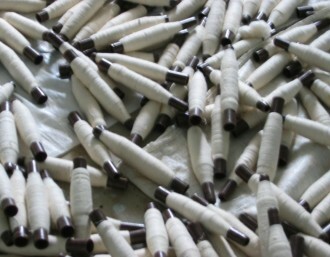 In his insightful Ph.D. dissertation on Gandhian science in the Khadi movement, C Shambu Prasad explores the incompatibility between the scale of yarn-spinning in large-scale spinning mills, and that of fabric production in the rest of the cotton textile industry in which the decentralised sector is the dominant player. Yarn in India is used for fabric production almost entirely by the decentralised sector which includes, primarily, powerlooms running on electricity, and to a significantly smaller extent, the handloom sector. Organised large-scale weaving mills use up only a small fraction of the total yarn produced. However, the annual yarn production of a typical large-scale spinning mill is hundred times larger than the annual fabric production of a typical powerloom or handloom unit. This incompatibility between the scale of the spinning industry and that of decentralised fabric production has resulted in several distortions. Handloom weavers need yarn in small quantities and of a diverse range, explains Prasad, which cannot be made available to them given the large scale of operation of spinning mills. However, small-scale spinning mills are believed to be unviable, because attempts to downscale the spinning mill throw up problems in the pre-spinning stage, as the blowroom component cannot be downscaled. "An alternate route that has not been sufficiently researched", he suggests, "has been to work from the other end, namely from cotton upwards." L Kannan, the man behind the machines specially engineered to make the Malkha effort a reality, decided to do just that (see this earlier article - link. While thinking through how rural areas could prosper economically, Kannan realised that agriculture had a finite scope. Trying to squeeze more out of the land could have damaging consequences. Looking at non-agricultural activities which generate wealth, he recognised that such activities would have to be rooted in the skills and abilities of the people in order to proliferate. This is how he came to be interested in rural industries. Examining the cotton textile chain, he found that production on a small scale dominated all its stages, whether it was weaving, dyeing or the manufacture of garments. Only spinning of yarn was centralised and happened on an enormous scale compared to these other activities. There was a gaping hole in the flag. Technological alternatives to spin yarn on a small scale would empower handloom weavers and free them from the debilitating stranglehold of large scale centralised spinning mills which kept yarn out of their reach. He knew that if he could stick this crucial piece into the textile jigsaw, the impact would be no less than profound. It would facilitate vertical integration in the textile industry, not on an inconceivably large scale, but instead, entirely on a small scale! "As an accidental bonus", says Kannan, "the quality of Malkha cloth is distinctly different from cloth manufactured conventionally, because though its advantages cannot be defined in conventional technical terms, people can recognise the difference." The principal contribution of the Malkha initiative is in its idea of rooting cotton handloom production in the rural economy. Recognising that environmental issues are often at the heart of social problems, the effort aims to address these complementary dimensions of the current crisis in the handloom sector. Given that the discourse on this sector in urban circles is dominated by the craft dimension, and increasingly by the fashion business, the Malkha effort is a welcome development which puts the focus back on the hands which work the loom. Neeta Deshpande is a freelance writer based in Bangalore. For more on Malkha, please visit malkha.in. Is Amravati really a 'capital' choice?